I wrote recently about how a small change in your own mindset can trigger a dramatic change in your dog’s behaviour - without any “dog training” at all! And I wanted to revisit this as it’s such an important - and little understood - part of the puzzle. While we say “My dog is this, my dog does that,” it’s all about the dog. The dog is perceived as the problem. But the fact is that it’s the perception that is wrong! 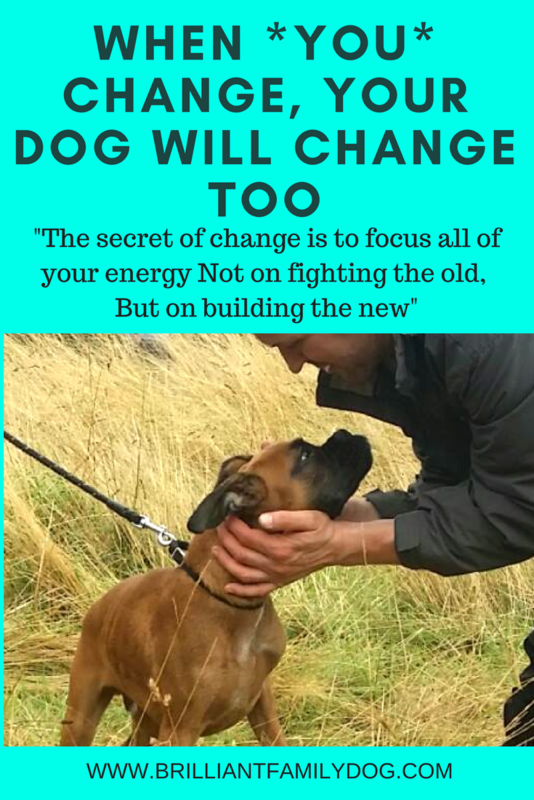 Once people change their way of thinking and talking about their dog, they get massive change without having to do a thing. As a child I was curious, questioning, always challenging what I was served up as gospel truth. So naturally, teachers didn’t like this and saw me as a threat (yes, even aged three …). So I was labelled “difficult”. I was the naughty child. This “knowledge” about me was passed on in reports and staff meetings, so that all new teachers were instantly brought up to speed with this troublemaker, instead of forming their own opinions from facts. The other children began to look to me for a response in new situations: I had a reputation to live up to! We have a much shorter time with our dogs - they simply don’t live long enough for us to spend years labelling them and predicting their poor behaviour based on our wrong assumptions. And these wrong assumptions can creep into every corner of our lives with our dogs. Whenever you say “She always does this,” or “She never does that,” you are placing a permanent label on your dog. You are fixing in your mind that she cannot change, that she’s hardwired to behave in a certain way. Focussing on the doing rather than the doer takes blame and finger-pointing out of the picture, leaving the way clear to solutions and change. And while we look at the behavior rather than the perpetrator, we see that nothing could be further from the truth than the belief that your dog is hardwired to behave in a set fashion. It doesn’t matter how long your dog has been doing a certain thing - you can change it! She’s afraid of things? You can make her environment less scary while you countercondition her to better responses. She’s boisterous and impulsive? You can teach impulse control and show her that she can get what she wants when she does what you want. There’s no need for confrontation, ordering about, “commanding”, having a battle over anything. She annoys you by barking noisily, chewing the furniture, messing up the house? Manage! Train! Once you realise that these things are just what the dog IS DOING, and not what the dog IS, you can change it all. I learn a lot from my students, as well as from my dogs! I’m delighted to watch my online students develop. The penny drops! They see where they have gone wrong in the past, not helped their dog. Sometimes they have unwittingly followed bad advice from the multitude of awful “trainers” and tv personalities out there, and actually made things worse. Tear off a new sheet! Start from where you are and head forward! It’s a joy seeing things improve for them without their needing extra gadgets, lockdown, extreme control. They see that opposition is just as unhelpful in their relationship with their dog as it is in their relationship with a friend or spouse. Embracing their friend’s likes and dislikes is part of the friendship. Empathy for their fears and foibles is essential to a strong bond. And a new life opens up for them with their dog, whom they can now view with different eyes. Check out this email course that will get you started on the change!